Cincinnatian Roger William Heuck descends from a family with an impressive artistic heritage. He is the great grand nephew of John Henry Twachtman on his mother’s side and on his father’s side is Edward Eisenlohr, who painted in Texas. His painting career began with his studies at the Art Academy of Cincinnati and was encouraged throughout his adult life by studying with contemporary professionals whose brush and palette he sought to emulate. He also gave back to the Cincinnati artistic community in many ways including serving as president of the prestigious Cincinnati Art Club. The term “Impressionism” denotes a style of painting technique so named because of its concern for the visual impression of the moment. Originating in France in the 1860’s, it is characterized by a spontaneous, casual brushwork, which often evolved into the signature of the artist, and seeks to capture the effects of shifting color and light. Mr. Heuck aligns himself with the adaptation of this movement as an American modification of painting style. It enjoys broad public popularity today as a style of painting outdoors, expressed in the french term: painting in “plein air”. In the 30 year retrospective celebrating the paintings of Mr.Heuck at Greenwich House Gallery, there is a little something for everyone. Heuck has explored a variety of subject matter with his impressionist approach to plein aire painting. This exhibition displays multiple examples of several favorite subjects. Hailing the winter season are several charming small works that are intimate in their commonality. Stacked firewood is softly blanketed by snow before heathery trees and distant crests of purple grey. A cheery yellow-orange barn peeks from behind a copse of snow laden fir trees in “Cary’s Barn”, playing complimentary color tag with the sky blues and deep shadow purples. In several paintings, Heuck embraces the cabins and camps of many vacation memories. In “Cottage that once was”, the purple roofed cottage on Fire Island is nestled in the brush and sand as warm summer winds cross the lake waters. On the distant horizon, the pink grey sky kisses the soft aquatic blue. He depicts other cabins at the edge of reflective waters or at the foot of blue mountain ranges. Several works were captured in Yellowstone National Park featuring the American Buffalo. 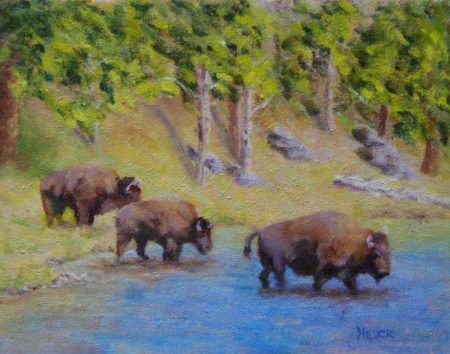 “Following Big Daddy” depicts a string of buffalo loping into warm summer waters. 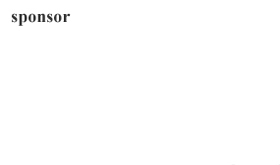 ” Munching Lunch”, a single adult bison dominates the scene, possibly a statement on the decimation of the species. Another wall features a series of landscapes with iconic architectural silhouettes. Blazing sunsets add dramatic color to his compositions. 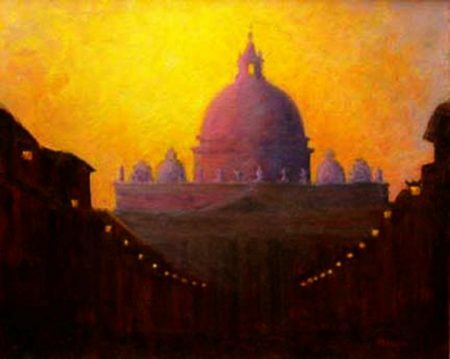 “Evening Glow at the Vatican” features the iconic dome of St. Peter’s Basilica in Rome. “Knee deep for Art’s Sake” depicts Heucks’ friend and mentor, Bill Schultz. 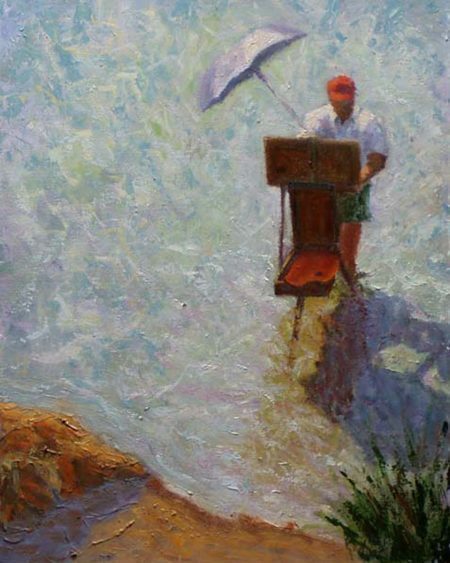 Schultz is depicted intensely involved in a painting in broad sunlight, heedless of being knee deep in water. Bill Schultz,1919-2005, is a co-founder and director of the American Impressionists Society (AIS). The next exhibition at the Greenwich House Gallery is the 2nd Annual AIS Impressions Small Works Showcase which opens March 23rd, 2018. This AIS program, sited at the Cincinnati Art Club in Eden Park, features outdoor painting and indoor workshops for area painters. This exhibit is a treat for anyone enamored of impressionists’ plein air painting.